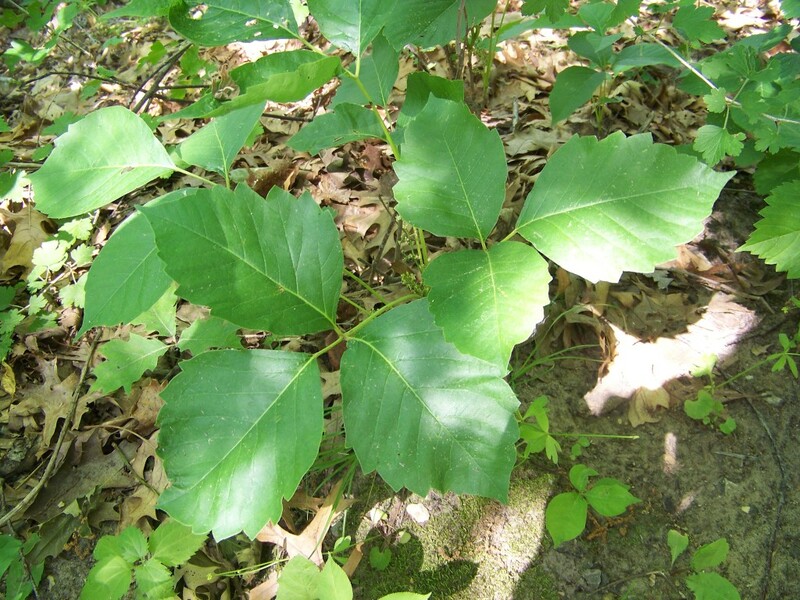 Poison ivy can be identified by 10 to 30 cm long ovate leaflets in groups of three. The leaves can be either shiny, smooth, and hairless, or rough, hairy, and velvety. Their characteristic appearance has led to the adage, “leaves of three, let them be.” Poison oak is more of a shrub-type plant with clusters of yellow flowers and cream-colored berries. Poison sumac is a taller plant with an average height of 4.5 m but can grow as large as 12 m in height. Leaves of the sumac variety are different because they are smooth and oval-shaped and found in groups of 7 to 13 from a central stem with pale-colored fruit. While there are various treatment options listed in the literature, prophylaxis via plant identification and protective clothing is best. Once contact occurs, only about 50% of urushiol can be removed within the first 10 minutes, 10% in 30 minutes, and none after 60 minutes. Topical symptomatic therapy, including the use of astringents, menthol- and phenol-containing compounds, cool wet compresses, and acetic acid wet dressings may provide anecdotal relief, but their efficacy not been proven. [3,8] As the dermatitis is not a histamine-releasing reaction, any benefits from antihistamines are most likely due to their sedating properties. Traditionally, the cornerstone of therapy is corticosteroid use. Topical corticosteroids can be given for mild to moderate disease, while systemic steroid therapy is required for moderate to severe presentations. Topical clobetasol 0.05% twice daily can be used to affected areas for two weeks. Oral prednisone should be dosed at 1 mg/kg/day for three to four days, with a taper over 14 to 21 days. It is important to note that abrupt discontinuation or inadequate duration of treatment has a high likelihood of causing rebound inflammation. 1. Shofner JD, Kimball AB. Plant-induced dermatitis. In: Wilderness Medicine. 6th ed. Philadelphia, PA: Mosby; 2012:1238-1244. 2. Lee N, Arriola E. Poison ivy, oak, and sumac dermatitis. West J Med. 1999;171:354-5. 3. Baer RL. Poison Ivy Dermatitis. Cutis. 1990;46(1):34-6. 4. McGovern TW. Dermatoses Due to Plants. In: Dermatology. 3rd ed. Amsterdam, Netherlands: Elsevier; 2012:281-287. 5. Sasseville D. Clinical patterns of phytodermatitis. Dermatol Clin. 2009;27(3):299-308. 6. Williams J V, Light J, Marks JG. Individual variations in allergic contact dermatitis from urushiol. Arch Dermatol. 1999;135(8):1002-1003. 9. Yosipovitch G, Fleischer A. Itch associated with skin disease: advanced in pathophysiology and emerging therapies. Am J Clin Dermatol. 2003; 4:617.